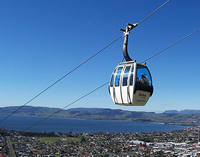 For one of the best views of Rotorua and its surroundings head on up to Mt Ngongotaha and take a Skyline Skyride gondola up the mountain. The small four-person gondolas will move you up the gradient in between five and eight minutes, depending upon visitor numbers, and the vista unfolding before you is terrific. You get great views of the city, the lake looks superb on a sunny day, and the island of Mokoia sits upon its waters like an enticing, mysterious destination. Once at the top you hop off the gondola and have a whole range of activities to keep you and/or the kids occupied. First stop could be luge courses set up so you can race down concrete tracks in cool little three-wheeled contraptions. You can regulate your speed with a handle brake system on either a beginners (2km), medium (1.7km) or fast track (1km). Once you are down the end of the luge runs you get carried back to the start on a very busy chair lift for some more fun. You can test your aim at a slug-gun shooting gallery - or your nerve on the Sky Swing. The Sky Swing is a strap-in chair that will get the adrenalin rushing as you swing around at about 150kmh. It is only on offer for those 10 and over and goes from 9.30am until closing time. If you are in Rotorua as part of a romantic holiday with your partner then this fellow can recommend having a meal at the restaurant because the views on offer are spectacular. 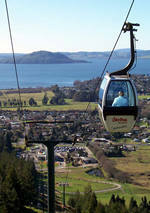 A visit to Rotorua will certainly be added to by a trip up the mountain.